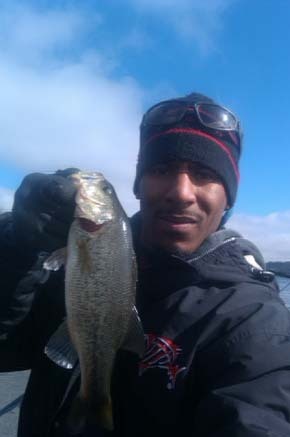 Wintertime bass fishing means deeper water fishing and that also means slow and small presentations. If you think you are going to go out and throw ¾ oz spinnerbaits and move them real fast like you do in the summer you’re not going to get a lot of bites. In the winter, I prefer a small 1/8 oz JD Lures junior jig with a small pork trailer. The pork will help slow the fall down and the bass seem to hold on to it longer than plastic trailers. A 4 ¼ “JD Stick on a Carolina rig or a drop shot rig (if the fish are suspended over structure) is another option. If there’s some cleaner water then I use baits like the IMA Lures Foxy Fry jerkbait on fluorocarbon line. The key to this bait is keeping it down in the strike zone and let it suspend. A Tabu Tackle “Tiny Tim” swimbait is another great option because during the winter the bass are not feeding very often, and the bait fish they are feeding on are very small. The Tiny Tim is perfect setup to use on a drop shot rig with light line and a light sinker. The key to all of these baits is that they are all downsized versions in these classes of lures. You are not going to get a lot of bites this time of year but with the smaller lures you will get a higher percentage of hookups, rather then you using larger lures. Wintertime bass fishing can be some of the most rewarding catches. If you use the lack of pressure, easy predictable locations of the bass and a small finesse presentation, you will be catching fish while others are at home watching TV.The biggest question that I get about winter bass fishing is where to fish. An area with quick access to deep water is the best place to start. Places like bluff walls, main lake humps, drop offs and the deepest end of main lake points, etc., are what you want to look out for in the winter months. If you live on a river system these patterns will work there as well, but the main thing about river fishing at this time of year is the current. Winter bass don’t like a lot of current because it makes them use a lot of energy, so look for back bays, chute & canals that have the same deeper water features but lack of main river current. While most youngsters are enjoying school being out for the summer, there is another type of school going on, summer school. I don’t mean your traditional classroom education type of summer school, I am talking about summertime schools of sand bass fish and hybrids. The action is fast and fun. Richland-Chambers reservoir is loaded with sand bass and an abundant supply of food for them to eat, shad. If you have not been out to Richland-Chambers reservoir lately, you might want to consider a trip in the near future. The bass are beginning their fall pattern, which means they are moving to the mouths of and into the creeks chasing shad. The sandbass and hybrids are also schooling on the south end of the lake, according to some local anglers, like Bill Young of Corsicana. Bill and his family recently caught 60-70 sandies and hybrids schooling on the top, near the dam. Been trying to get out all winter for a little #icefishing. Finally got a chance to get out with my longtime friend Eric Fieldstadt (Great fishermen and photographer). If you’ve never been ice fishing, you might be wondering why anyone in their right mind would want to walk out onto a frozen lake or pond and start drilling holes. The answer is simple… Addiction to Fishing!